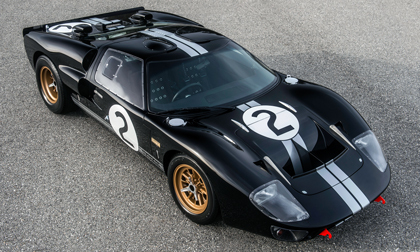 LAS VEGAS – Jan. 29, 2016 – As Ford Motor Company readies the latest generation of the Ford GT to compete at Le Mans, Shelby American, Inc., a wholly owned subsidiary of Carroll Shelby International Inc. (CSBI:PK) will offer a limited run of twenty total 50th Anniversary Shelby GT40 MK II cars to honor this historic racing achievement. In the mid-1960s, Henry Ford II turned to Carroll Shelby to help the blue oval capture the international sports car championship including an overall win in the world’s biggest car race, the 24hours of Le Mans. Beginning with a victory at Daytona in February 1966, Ford and Shelby dominated sports car racing. They combined for a 1-2-3 sweep of the 1966 Le Mans race and then won it the next three straight years. The Shelby continuation cars are built around the original style steel monocoque unibody chassis and fully independent suspension using unequal length A-arms. Over two-thirds of the parts are interchangeable with the original racecar. The car also stays true to the original GT40 MK II’s dimensions (163 inches long and 40 inches high) with the same two 10-gallon fuel tanks. Even the cockpit stays true to the original with Smith style gauges and silver riveted seats. It can be ordered in right or left-hand drive and in 3 different color configurations including black/silver, blue/white or red/white with the original 15 inch Halibrand style pin drive wheels. Other than the introduction of adding the creature comfort of air conditioning, with a big block Ford FE 427 engine installed, the car looks and feels like it just stepped out of Parc Ferme. “The Shelby GT40 MK II 50th anniversary edition is just the kind of car that Shelby collectors and ‘60s-era race fans appreciate about our legacy and want in their collection,” said Keith Belair,Shelby American Chief Operating Officer. The 50th Anniversary Shelby GT40 MK II MSRP is $169,995 for a rolling chassis. More information is available at www.Shelby.com or by calling (702) 942-7325. Founded by legend Carroll Shelby, Shelby American manufactures and markets performance vehicles and related products. The company builds authentic continuation Cobras, including the 427 S/C, 289 FIA, 289 street car and Daytona Coupe component vehicles; it offers the Shelby GT, 1000, GT500 Super Snake, Shelby Terlingua Racing Team and GTS post-title packages for the 2005-2016 Ford Mustang. Shelby American also builds the Shelby Raptor and Shelby F-150 muscle truck. For more information, visit www.shelby.com.